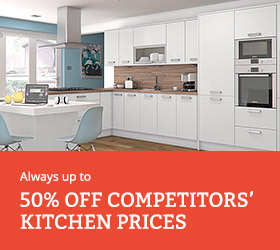 Home » Customer Questions » How much should the average kitchen cost? How much does a kitchen cost? This is such a difficult question to answer as there are many factors such as shape, door style, amount of units, additional functional wireworks used and appliances. For this example kitchen cost, we will assume that an L-shaped kitchen is being used (3050mm by 3050mm), with basic highline units and no additional wireworks or appliances. This will give you a standard price and some idea of what the actual wooded pieces in your kitchen actually cost. 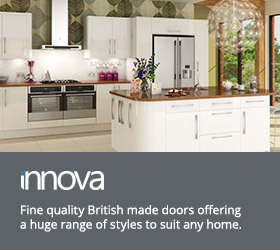 We will also price up in our Innova Luca matt white door, which is a quality door and comparable to the white matt handleless doors that are sold by the high-street stores. 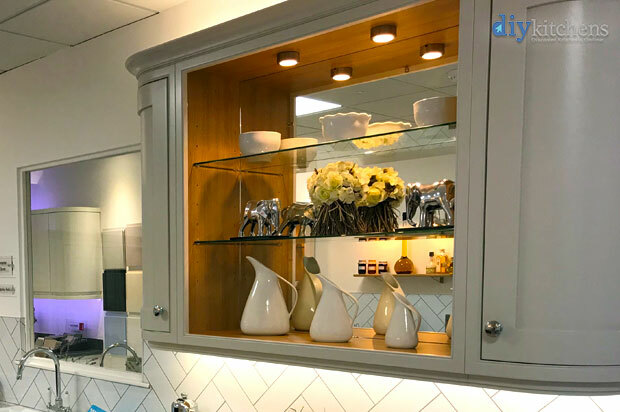 The style of door does not require end panels as the kitchen units are finished in matt white paint, the same as the doors which helps to keep the kitchen costs down. We have used our PDF planner (PDF Kitchen Planner) to knock up a simple floor plan with the units that would be needed for this kitchen. The only consideration we have to make in this kitchen is the window on the left hand wall. 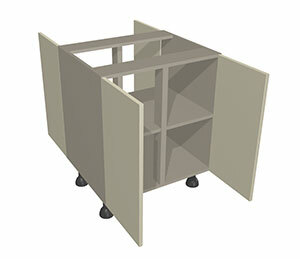 Hover over the image below to see the wall units slotted into position. 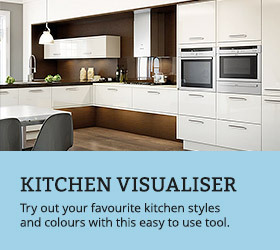 You don’t have a be a kitchen planner or builder to be able to design your own kitchen. You just need the dimensions of the room and then look at our vast range of units that we have available. Fillers may be needed at the end of each run if they run to a wall where there is a gap between the last unit and the wall. The space left from the example above is 20mm on each run. A piece of plinth can be used here and cut down to act as a filler. The kitchen plan above makes the assumption that you have a freestanding fridge/freezer. 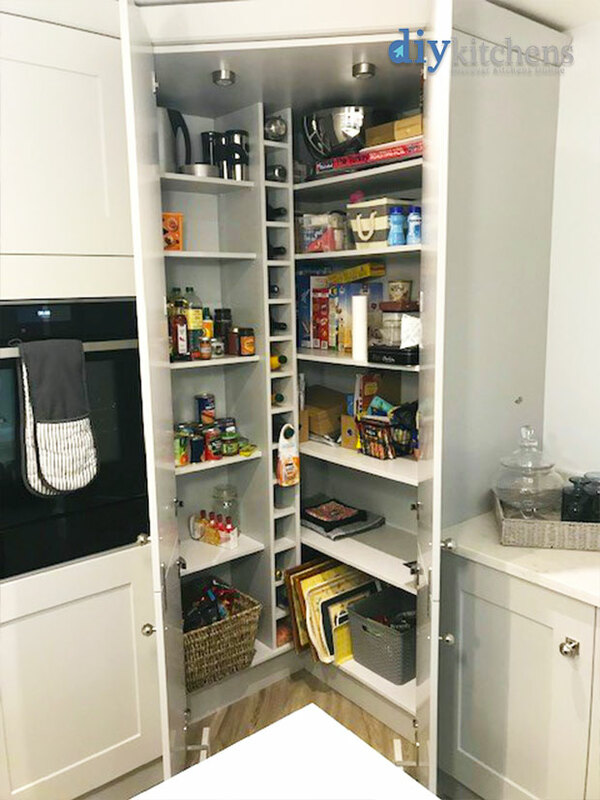 If you are planning to have this integrated then you would need a tall fridge/freezer housing, which are 600mm wide and would probably fit best at the far left of the run with the kitchen sink in it. The items below constitute all the wooden units, worktops & plinth that are required to complete the kitchen design, pelmet and cornice are optional to kitchen designs, so have not been added for this example kitchen cost report. 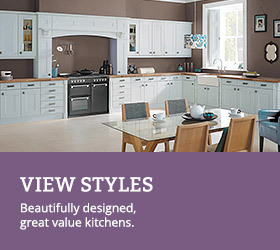 The kitchen above with the items mentioned would cost you £1,797. There is also a charge for delivery. Gas hobs need space left and right of the hob, which is stated as being 50mm. No wall units can encroach in that space if less than 460mm from the worktop. A lot of designs that you get drawn up, you will see end panels at either side of a built under single oven housing. You don’t have to have these. There is a good website below where you can ask building related questions or even find a tradesman to fit your kitchen or even rip the old one out and adapt the room. What is an in-frame kitchen?